Up Close And Personal that's what this release is all about. These intimate recordings give an unique insight in the private life of Elvis Presley. Highlights on this release are the 1960 Los Angeles California recordings in STEREO. These recordings come from a recently discovered unique stereo tape which sounds better (it s in stereo!!) and is more complete then ever before. Including two unreleased stereo recordings of You'll Never Walk Alone (Although short, it s unique!) & If I loved You / The Lord's Prayer. This release also features Elvis at the Eddie Fadal residence in Waco Texas approx may 1958. Elvis is having a ball with Anita Wood, Eddie Fadal & Janice Fadal. For the very first time you can hear the COMPLETE uncut tape including previously unreleased versions of Happy Happy Birthday Baby. Then you are treated on some home recordings that were recorded at Goethestrasse in Germany during his army days. 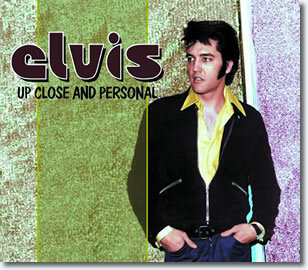 Obviously these are home recordings recorded on a tape deck (two tape decks when it comes to the stereo recordings) but that is all forgotten when you hear Elvis relax in a private situation. It s an unique insight in the man's life. It s Elvis up close & personal. Every effort has been made to achieve optimal sound quality, priority has been given to the historical content.